After my recent adventures in soap making, I got a little hooked. I just can't tell you how easy it is! I'm doing the 'melt and pour' method of soap making though, the kind where all I have to do is....well, melt and pour the soap. When I told my husband that I learned how to make soap, he pointed out that I'm not actually making the soap, I'm just mixing it. Way to crush my little crafting heart. Next time he goes to play one of his computer games I'm going to remind him that he's not actually a wizard. So back to making soap. I have these cute silicone heart molds that were meant for muffins, but why make muffins when I could have a year's supply of heart soap? 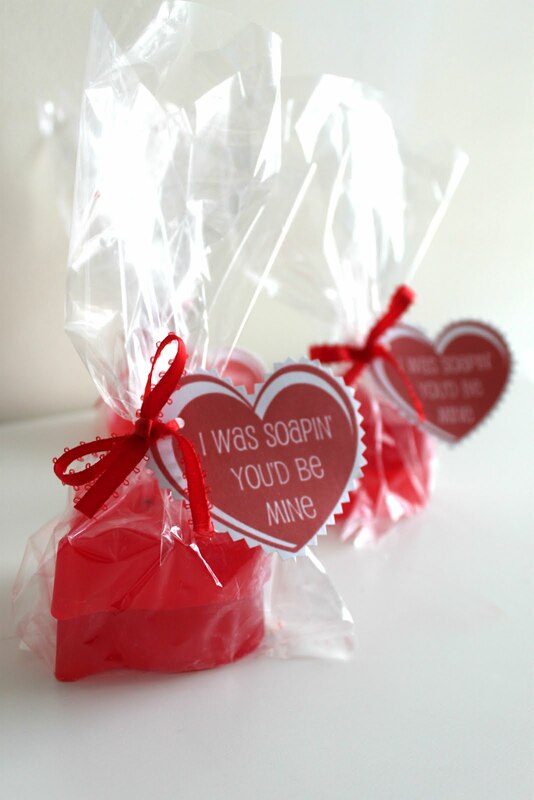 I also included some free downloadable tags so you can give them as gifts. First, follow the instructions on the back of your glycerin soap to melt your soap in small batches (5 or so ounces at a time). I like to use a kitchen scale to weigh out the soap, then melt it in a clear measuring cup to make it easier to pour. After you have your soap melted down, stir in your desired amount of food coloring until the color you want is achieved. Next add your fragrance according to the package directions. Pour your soap into the mold and allow it to dry. Mine took approximately 30 minutes, but time will vary based on size of the mold and amount of soap. After it's cooled, pop your soaps out of the mold, and it's ready to be bagged! I made some free downloadable gift tags that you can download HERE. Just print on cardstock and use decorative scissors to cut them out. 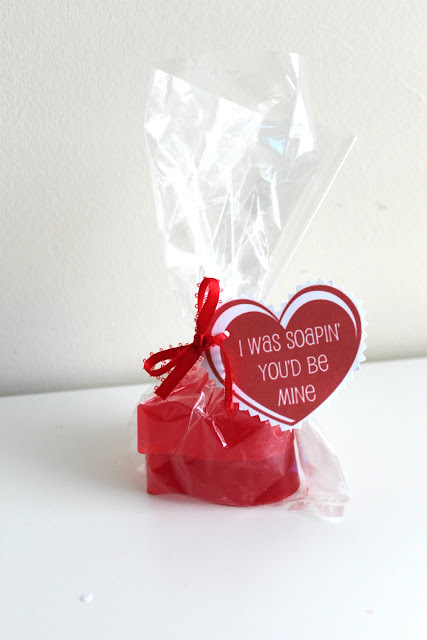 To package my soaps, I put a couple of them in a cellophane bag and tied it with ribbon. Then, I punched a hole in one of the sides of the tags and threaded one of the ends of the ribbon through it. Simple and cute. 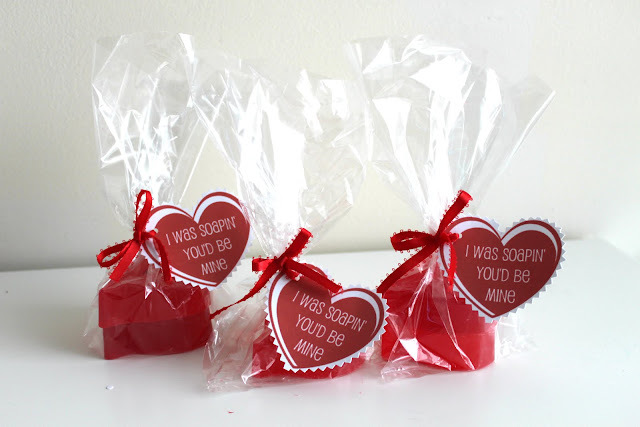 These heart soaps would make a great Valentine gift for co-workers or friends! Those are absolutely adorable, Jen! And to your husband... whatever! You are so making soap. When you make cookies, you just mix the ingredients together but as far as I know, everyone still says they're "making" cookies, right? adorable!! Super fun and cute - I bet Patrick wouldn't say that if you make Steeler shaped (logo or helmet) soaps LOL! This is such a cute idea! I would love for you to link this to our party! This is really cute. Such a great alternative to candy! Thanks for sharing. That is such a fun Valentine! The printable is so fun! I bet my boys' teachers would love this! Stopping by from Serenity Now. This is wonderful! Excellent idea! These are awesome! I hope you will link this post up to my "I Heart Projects" Party if you haven't already done so. This is so cute. Saw you over at I Heart Naptime. So, so cute! I love the idea. What type of fragrance did you use and where did you get it? I love "making" soap too. I'd love for you to share this at my very first link party.